"Great Value... Simply The Best!" Stage, BBQ & Service Bar Available For Events & Rallies! Our casitas & cottages are the perfect mix of camping combined with all the comforts of home. Other amenities include a state of the art fitness center, custom billiard table, custom shuffleboard and professional pickle ball courts. Less than an hour from the Vegas Strip, Wine Ridge RV Resort & Cottages is one of the most beautiful destination RV resort and lodging experiences in the Southwest! We are all new, all first class, and all at great value for you and your family. Our motto says it all: “Five star quality and service at two star prices!”. The cottages are fully furnished and include a bathroom, bedroom with queen bed and quality linens and a living room with sofa/sleeper double bed. Prepare your own meals in our fully equipped kitchen. A 55-minute scenic drive from the world famous Las Vegas Strip and just 45 minutes to Furnace Creek at the heart of Death Valley, our Resort is next to the pristine vineyards and winery of the award winning Pahrump Valley Winery and 5-star Symphony’s Restaurant. Our Activities Director develops a new schedule monthly. Typical activities include poker games, waffle and egg breakfasts and catered dinners, 4 wheel ATV tag along mountain trips, happy hour get-together, karaoke nights, bingo & ice cream nights and pickle ball lessons and competitions. 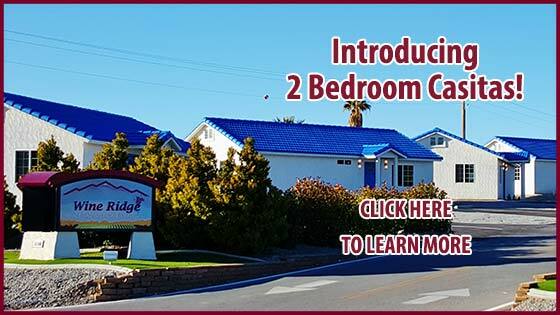 Wine Ridge RV Resort & Cottages is please to introduce to you our luxurious and spacious new 2 bedroom, 2 bathroom Casitas! The bedrooms are spacious with comfortable king size beds. By popular demand we are back with a few pet friendly cottages. We have added many new, first class amenities for the enjoyment of our guests. Our newest swimming pool is gorgeous, uniquely designed and perfect for water volleyball, aerobics, and relaxing. Being a short distance from the Las Vegas strip, lots of places nearby. Front Sight Firearms Training Institute, Spring Mountain Motorsports Ranch, Mountain Falls Golf Club, China Ranch Date Farm and lots more.